to the top of the Matterhorn. 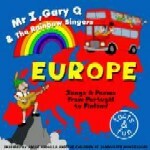 Learn many interesting facts about the countries in Europe as you sing along with Mr. I and the children. A great song that mentions all of the countries of Europe. To the tune of B-I-N-G-O. Teaches some things about Paris. Oo La La! Gary Q learns to sing Italian. Facts about Leonardo da Vinci. Fun song from Miss Anise. Fun to be at the top! Great song about the castles of Europe. Yes, the real Greece song.